We all know how important aircraft seats are. Different airlines have different seating arrangements and sizes. I would say Cathay Pacific is very generous about their seating space. 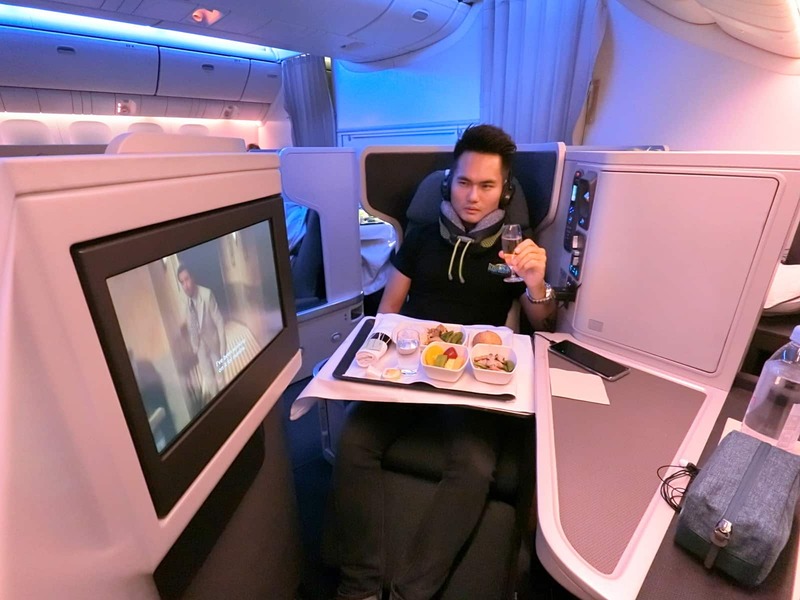 On my flights from Singapore to Spain via Hong Kong, I got to experience two different seating arrangements of 2-3-2 (Singapore to Hong Kong) and the 1-2-1 (Hong Kong to Madrid) in the Cathay Pacific Business Class cabin. The 2-3-2 seating configuration was spacious and comfortable, but there was one flip side to this configuration, the middle and window seat passengers have no access to the aisle, which means they would need to be excused in order to get to the restroom. Another thing to note is that the seats in this configuration cannot be fully reclined, but such plane is scheduled for short haul flights only. The slanted 1-2-1 seating configuration looked classy and modern. One of the great thing about this seating arrangement was that every business class passenger could have an access to the aisle. Every passenger has a bit of their own privacy because every seat is compartment-ed! On the flip side to this, the seat felt a little smaller as compared to the 2-3-2 arrangement, which was probably due to the design that created the compact feeling! Nevertheless, I would prefer this layout than the 2-3-2 layout for sure, because the seats can be fully reclined to provide a more comfortable sleep! Definitely more privacy and comfy which was critical for long haul flights. Being a vegetarian, I have tried many Bee Hoon dishes before with other airlines. In my opinion, the Bee Hoon served with the mock meat char siew (vegetarian pork) was a pleasant surprise from Cathay Pacific Business Class as the taste was quite good. Although I’m not a fan of mock meat especially the vegetarian char siew, I still have to credit Cathay Pacific for trying their best to make this dish delicious for passengers. The best way to a person’s heart is through his/her stomach. Cathay Pacific did a brilliant move by including this South East Asian tropical dessert on their menu. This fragrant and delectable pandan pudding would most likely remain in the heart and memory of the passengers wherever they go. This is my special recommendation! Of course, wines and coffees are great choices too, but you MUST definitely try the on-board Hong Kong milk tea! The milk tea in Hong Kong is a very local and famous traditional beverage. Must really try this amazing Hong Kong Milk Tea! Whether Cathay Pacific Business Class or Economy Class, I believe the service standard they deliver is consistently great! When transiting in Hong Kong at the Chek Lap Kok airport, do remember to enjoy the great shopping experience, from Hong Kong jewellery to foodies treats such as Wing Wah Cakes, Muji, Kee Wah Bakery, Godiva Chocolatier and other souvenirs, and much more… However, these are not important when you have access to the Cathay Pacific Business Class Lounge! haha. This was another major attraction of the entire Cathay Pacific Business Class experience! Read: Cathay Pacific Business Class Lounge Review! one of the best plane, its quite expensive but its worth it.. i try the saudian and emirates too!! you can have bath lol this is cool for a 18hr. travel! !